The following article by Janet Moore and Baird Helgeson, was published in the Star Tribune on January 22, 2014. It is interesting to note that the state supreme court said that it lacked jurisdiction to hear the lawsuit. Therefore, the constitutional issue was not addressed. Public financing of the $1 billion Vikings stadium is back on track after the Minnesota Supreme Court on Tuesday dismissed a last-minute legal challenge that threatened to delay the project. State budget officials are now scrambling to sell $468 million in bonds in coming “days or weeks,” spokesman John Pollard said. “Timing of the bond sale is currently being worked on and will commence as soon as possible,” he said. 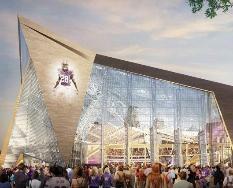 While the stadium is still slated to open in July 2016, two key land sales involving the Downtown East light-rail plaza and a parking ramp that were tentatively scheduled to close this week were postponed for a “few days” because of pending litigation, said Michele Kelm-Helgen, chair of the Minnesota Sports Facilities Authority, the public body overseeing the project. But she said she didn’t expect any problems to arise from the delay. Construction on the new stadium in downtown Minneapolis continued as the courts sorted through the legal challenge lodged by three Minneapolis residents 12 days ago. The Metrodome’s roof was deflated on Saturday, and demolition work on the structure’s foundation commenced shortly after. But any further delay could have had a serious impact on the project and might have affected a related $400 million mixed-use development, as well, Kelm-Helgen said. “We’re just so very thankful that the courts acted so expeditiously and obviously with a positive result,” she said. The lawsuit, filed by former Minneapolis mayoral candidate Douglas Mann, his wife, Linda, and onetime city school board member David Tilsen, claimed that using Minneapolis sales tax revenue to repay state bonds for the stadium was unconstitutional. The last-minute legal challenge prompted the state to abruptly cancel last week’s scheduled bond sale. But in a five-page order handed down Tuesday, the Supreme Court ruled it does not have jurisdiction over the matter. Also on Tuesday, the state Court of Appeals denied an appeal by Mann of another lawsuit he filed earlier in Hennepin County District Court seeking a referendum in Minneapolis over stadium funding. The court said the appeal was not filed in a timely manner. Mann, who describes himself as a “laid-off licensed practical nurse,” said Tuesday he was disappointed with the rulings. The Supreme Court “didn’t rule on the constitutional issue I raised. They danced around it, they didn’t touch it at all,” he said. Minnesota Management and Budget Commissioner Jim Schowalter said in a statement the rulings make “the path to permanent financing of the stadium more clear.” Now, the state is focused on “selling the necessary bonds to keep the stadium project on track and allow the stadium authority to make timely payments on construction and land acquisition agreements,” he said. The authority is expected to purchase the Downtown East light-rail plaza for $17 million and an adjacent block now owned by the Star Tribune for about $7 million. The latter block will be used for a 1,600-space parking ramp, which is part of a mixed-use development proposed by Minneapolis developer Ryan Cos. in a largely barren area of downtown. Called Downtown East, the Ryan project includes two office towers for Wells Fargo & Co., up to 400 apartments, retail shops, restaurants and a public park on lots owned by the newspaper. The authority will own the parking ramp, which be used by office workers, the public and stadiumgoers. He said the project will be “delayed slightly” because of the legal challenge to state funding. Lester Bagley, the Vikings’ vice president of public affairs and stadium development, said the team was thrilled with the ruling. This entry was posted in Uncategorized on January 25, 2014 by citoyen1789.